As you might gather from the title, the HTC Desire 10 Lifestyle has a trick up its sleeve. Launched alongside the HTC Desire 10 Pro, the Lifestyle version offers the same body design as the "Pro" version, but makes some key changes. 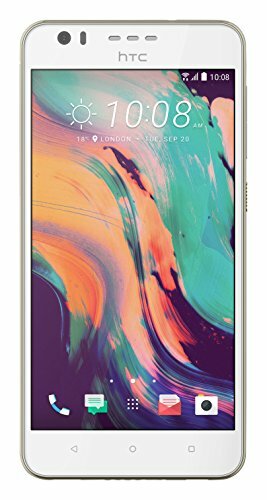 Pitched into the mid-range, this is an affordable handset, with HTC confirming that it will hit a £249 price point, making it pretty much entry-level, except in one area: audio. Here's how the HTC Desire 10 Lifestyle breaks down. Which is the best mid-range phone under £400? Designed to look the same as the Pro version, the 156.9 x 76.9 x 7.7mm chassis carries a deliberately classic design. Coming from HTC's Desire family, plastics are expected and that's what you get, unlike the metal One devices. To make things stand out, however, the design of the Desire 10 devices adopts some of the hallmarks of art deco. Pairing the coloured bodies with gold trim, the antenna bars neatly blend into the detailing an emotive high-contrast effect. There's a high degree of quality to the finish, although it lacks the premium solidity of the HTC 10. Importantly, the Desire 10 Lifestyle is interesting. It comes in black, white, a unique "valentine lux" and royal blue. HTC told us that the aim was to create something that had an emotional tie. These colours are designed to trigger memories of key moments in your life. We just think it's nice to have something different. Talking of difference, one of the key design differences from the Desire 10 Pro that it launches alongside is the speakers. The "pro" handset misses out on BoomSound - HTC's signature audio addition - but the Lifestyle handset comes rocking stereo speakers, with full BoomSound Hi-Fi Edition skills. That shifts some of the design around a little, with the larger punctuations at the top of the display, and the classic drilled speaker holes at the bottom. There's a lanyard attachment point off to the left and Micro-USB off to the right. If those minor details don't mark the Desire 10 Lifestyle out to you, the adornment of the Hi-Res Audio logo on the rear should make it abundantly clear. The audio story continues in the internal hardware, with the Desire 10 Lifestyle carrying the same 24-bit DAC as the HTC 10. That means your music will be upscaled for better performance and there's more power to drive more demanding headphones. We listened to the same track on the Desire 10 Pro and the 10 Lifestyle and the latter handset has the edge is delivery, if you have the quality of headphones to exploit it. It also offers Dolby Audio. The audio credentials are very much a sugar frosting on an entry-level cake, however, as this phone is powered by a quad-core Qualcomm Snapdragon 400 chipset, with 3GB and 32GB storage. There is a microSD card slot for expansion of the storage, and the version we saw was dual SIM, which we're unlikely to see in the UK. The lower-spec tale continues with the 5.5-inch display, which has a resolution of 1280 x 720 pixel for 267ppi. At this size the step down to an HD display means things aren't as sharp and crisp as they are on many other devices. This move has been made in the name of keeping the cost down and the upshot may be a longer battery life. A 2700mAh powers the handset and offers fast charging; with a limited hardware load-out, the battery should last a fairly long time. The Desire 10 Lifestyle dips the resolution of the cameras compared to the Desire 10 Pro, although that might not be a bad thing. On the Lifestyle you have a 13-megapixel rear cameras with f/2.2 lens. You miss out on the laser autofocusing that the Pro model offers, however. The front camera is 5-megapixels rather than the 13 of the Pro, but that might not matter: just how big do you need photos of your face to be? The proof of a good camera is in the shooting and sadly we've not had the time to see how the Lifestyle will perform in the real world. With a software experience comprising of Android Marshmallow and HTC Sense, the HTC Desire 10 Lifestyle will have many of the slick features found on the HTC 10 flagship, such as custom themes. But it's also a fuss-free approach, ditching a lot of bloat and only changing the things that HTC can make better. Priced at £249, the Desire 10 Lifestyle pulls off the act of giving you a handset with distinctly different design and pairing that with audio performance that's rare on a lower-spec device. If you're a music fan, then the HTC Desire 10 Lifestyle might well be the phone for you. With that said, the entry-level specs compared to something like the cheaper Moto G4, might see this handset with little to shout about, other than the audio performance.